I first saw Kazuko Tamaoki when she visited the Japanese American National Museum in Los Angeles on August 10 to attend a panel discussion about the Friendship Dolls exchanged between Japan and America. Mrs. Tamaoki presented new Japanese dolls to both Sidney Gulick, 3d, and Noriko Kohno to express her gratitude for their involvement in Friendship Doll activities. Since there were many people at the meeting, I did not have a chance at that time to meet Mrs. Tamaoki. I was interested in talking with her since I had heard she had restored the kimono for Miss Okayama, one of the 58 Japanese Ambassador Dolls given to America in 1927, and had been involved in other activities related to Friendship Dolls exchanged between the U.S. and Japan. Mrs. Tamaoki's daughter Yoko, who lives in the Los Angeles area, relayed a message to her mother in Nagoya, Japan, that I was interested in finding out more about her Friendship Doll activities. I arranged to meet Mrs. Tamaoki at her doll shop in Nagoya on a Sunday afternoon. This was my first visit to a doll shop in Japan (or anywhere in the world), so I was not quite sure what to expect. Mrs. Tamaoki, dressed in a kimono, came to the subway station when I arrived, and we walked back together for a couple of blocks in the rain to her two-story doll shop. The shop was filled with several types of doll, but many were Suiho-style dolls personally designed and created by Mrs. Tamaoki. Before my arrival at the doll shop, Mrs. Tamaoki had brought out many photos and articles about the Friendship Dolls and the exhibition of her dolls in several places around the world. We spent an enjoyable afternoon looking at the photos and talking about her many activities to share Japanese dolls and culture with others. During my afternoon chat, Mrs. Tamaoki described her many Friendship Doll activities. I was amazed when she said that she personally donates about 40 dolls each year to the program sponsored by the Japanese Cultural Center of the Mukogawa Fort Wright Institute, which distributes the dolls to elementary schools throughout the U.S. She also has made visits to five American schools to show the children her dolls and talk about the culture of Japan. She expressed her strong desire to continue to give dolls to schools and children in America to foster international friendship and understanding. Mrs. Tamaoki has also provided much valuable assistance to the preservation of the Japanese Ambassador Dolls sent from Japan to America in 1927. "I do not do it for money," says Mrs. Tamaoki. "I do it because I like to make them look as beautiful as they were created to be." 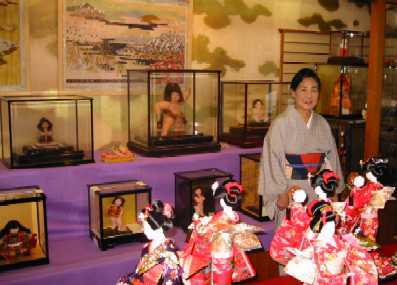 She expertly redressed Miss Yokohama in a 1995 visit to Colorado, and she purchased a display case so the doll could be on permanent display. She also repaired the kimono for Miss Okayama, which included supplying missing silk fabric for the lining of the sleeves. Mrs. Tamaoki has also supplied and made accessories for about five of the Japanese Ambassador Dolls. For example, she made an obijime (fastener to hold the sash for the kimono) for Miss Kantoshu. Many of these accessories have been provided after Mrs. Tamaoki found out about missing or damaged accessories from Michiko Takaoka, who has visited each of the 44 Japanese Ambassador Dolls that have been found throughout the U.S.
After a long talk in Mrs. Tamaoki's doll shop, we walked a couple of blocks to her doll factory. The small two-story factory now employs six women and one man, but in the past as many as 30 people worked there. The workers sit on the floor on tatami mats as they make dolls on low tables in a small second-floor area crowded with various doll-making materials, such as numerous brightly-colored rolls of silk for making the kimonos. Her company produces each day about 20 handmade dolls, which are sold in department stores throughout Japan. Mrs. Tamaoki personally makes about one doll a day, and this includes dressing the doll in a kimono with obi (belt for kimono) and other accessories. She creates the first mold of her dolls and designs the costumes before allowing her staff to reproduce them. 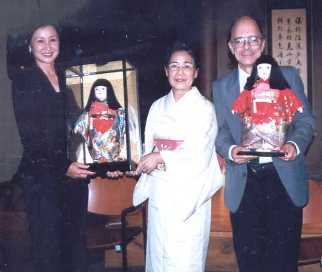 Mrs. Tamaoki received her Red Master's seal in 1955 from the Ozawa Doll Institute. In 1961, she started her doll making company, Dolls of Tamaoki, and established a doll school in Nagoya. 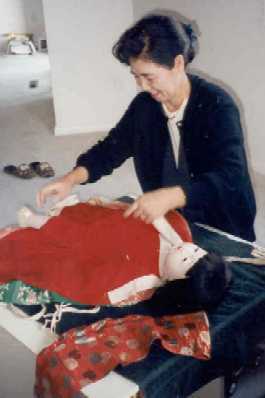 Mrs. Tamaoki gives many lectures on Japanese dolls and culture, and she participates in numerous doll exhibitions. Through these lectures and exhibitions, she shares her artistic and technical talents by creating her exquisite dolls before her audiences. For example, for the last several years she has visited Los Angeles in early August to exhibit her dolls at the Nisei Week Japanese Festival. She seeks to introduce Japanese traditional arts to people outside of Japan in order to create international goodwill. Her dolls are owned and displayed throughout the world. On the walls of her shop are displayed several of the many awards she has received for her doll making skills. Both times I have seen Mrs. Tamaoki, once in LA and once in Nagoya, smartly dressed in a kimono. Since most Japanese women nowadays do not wear kimonos very often, I was very surprised when I found out she owns about 150 kimonos and wears one every day to work. Although Mrs. Tamaoki has reached the age of 68, when many people have already retired, she still works seven days a week at the occupation she loves so much. She also goes to the U.S. about four times a year for three or four weeks each visit in order to see her daughter's family in LA. However, even in the U.S. she busies herself with the restoration of old dolls and making new dolls. Many of Mrs. Tamaoki's dolls are designed in sets to represent some aspect of Japanese culture. For example, one of her sets includes a grandmother carrying her granddaughter to the temple for a dedication ceremony with mother and brother walking along. Another set has a mother teaching her daughter how to weave with an elaborate loom with miniature spools of thread. Another shows two children in the snow, with the boy holding a snow bunny he has made. The use of various accessories gives each set a unique story to tell. Mrs. Tamaoki has generously shared her talents to support many Friendship Doll activities, and she expressed to me her strong desire to continue to send Japanese dolls to American children so they may better understand Japanese culture. If anyone is interested in obtaining a doll for children in a school class, please send a note to the following e-mail address: Suiho@earthlink.net. Special thanks to Rosie Skiles for providing various information about Mrs. Tamaoki's activities and for allowing me to use some information from her article entitled "Kazuko Tamaoki: 45 Years of Expertise," published in the Spring and Summer 1995 edition of the Ningyo Journal.